Replenish and rejuvenate with the AHAVA Dry Oil Moringa and Prickly Pear Body Mist; an anti-ageing, aromatic blend of nourishing ingredients and Dead Sea plants that work to restore soft, smooth and hydrated skin. Harnessing the powers of Jojoba and Sesame Seed Oils, the luxurious spray delivers intense moisture whilst Dunaliella Algae and antioxidant Vitamin E strengthen the skin’s natural protective barrier and defend against free radical damage for long-lasting comfort. 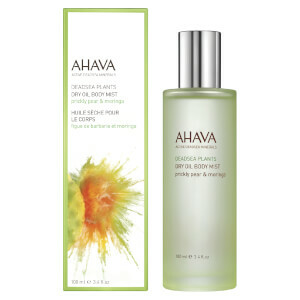 Skin is supple, radiant and youthful-looking with a subtle fragrance of Prickly Pear and Moringa.